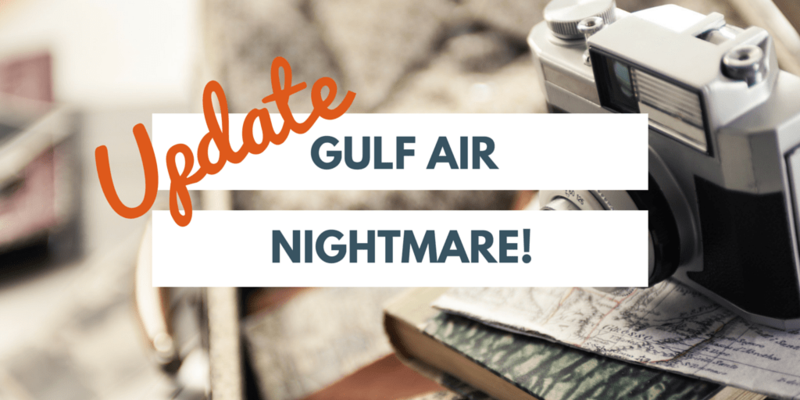 If you have been following my recent articles you will know I had the best (not) experience with Gulf Air. I actually received a few emails asking me for an update and checking on me which I found really sweet. Thank you so much for this. We are back in the UK now and I will be starting the write up of my trip review; a “How to series” on how I booked our tickets as well as updating on the process of compensation from Gulf Air. Which I am totally dreading to start since nobody replied to my emails EVER! When I called to confirm our tickets with Gulf Air, after Virgin Atlantic reassured me they are issued and gave me their reference numbers, I was told that we still don’t have a ticket and that business class is full. Ahmed was the only nice guy in Gulf Air and after half an hour he told me he will try and confirm these tickets for me, but I have to wait for 24hrs. Nevertheless after about 4 hours I received an email saying my tickets are confirmed. Yay! I also had the Gulf Air reference number which was OK when I checked online. I could finally breathe and enjoy my last days of Umrah- since this whole fiasco did take about 6 days to sort! On our way from Jeddah to Bahrain business class had only 3 people out of 8 seats which were supposed to be full. Not sure why and how. I asked the air hostess who said that indeed it was booked but the people had fake visas. Only God knows but business was definitely not full. For some reason this time in my travel life I decided to take half my wardrobe. I usually don’t and I hate carrying things but I thought it will be fun to change and have options for dinner and morning walks. Especially since it is boiling hot in Saudi and Dubai and we were staying for two weeks. Of course I didn’t need all these clothes and I spent my days with 2 abayas (black dresses compulsory in Saudi) and a few normal tops and dresses underneath. Mostly because I didn’t have my suitcases. Our luggage was lost by Gulf Air and Jeddah airport for 6 days. I honestly didn’t have any hopes of retrieving them. I was trying to call every day 10 times a day and nobody at Jeddah airport answered the phone. Seriously why do you have a contact number if you are not going to answer it. Thankfully the managers of the Hyatt Regency Makkah were very nice and they offered to take us to the Airport on our way to Jeddah. Had it not been for them we would have not had luggage for 9 days. The lost and found of Jeddah airport said they cannot enter Makkah, which was true for the first three days but after Eid roads were clear. If we could get out then they could get in too. So we lost our bags on the 12th of July at 10 am in the morning and we received them back thankfully in tact on the 18th of July at 4pm. We had to drive the 105km to Jeddah airport to collect our bags otherwise we would have received them on the day we were flying out. Totally crazy! I spent so many hours on the phone during this trip that it’s totally frustrating and sad. An Umrah trip should not be like this and I don’t wish this to anyone. Saudi Arabia is one of the most frustrating countries; there is no customer service, no care in the world for the needs or requirements of anybody than their own. It is very sad that the only people that can actually get things done are those who are bullies or don’t care for anyone but themselves. Even the younger generation is like this because otherwise you are left at your own devices and most of the time you won’t survive. It is like a jungle and only those who can manage to navigate it survive. I am sorry if it seems harsh but this is my observation from experience. Totally sad unfortunately. Thankfully we are back in the UK. I missed home, the order, the proper driving and the fact that people answer the phone in a polite manner. 🙂 Small things like this make me smile and I am totally more appreciative of them. Most of the Gulf countries are like that, Saudi no different. Which is amazing because there is nothing Islamic about it….go figure! Unfortunately. I personally think Saudi is the worst of all ..